We speak to the grande dame of the Malaysian art scene about her passion for nature and fierce devotion to her craft, as well as protecting her family’s heritage, ahead of the Song of Eucalyptus exhibition, which marks the 50th anniversary of her illustrious career. When Datuk Sharifah Fatimah Syed Zubir tells me she has come from her home in Taman Bukit Teratai near Cheras, I cannot resist a smile. 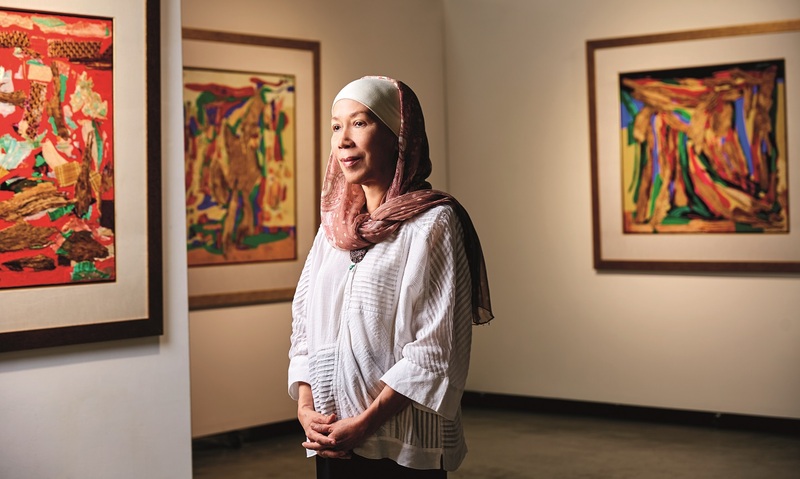 Never would I have imagined that an eminent art stalwart — the First Lady of Malaysian abstract art, as some may call her — was living just a 15-minute drive from my home. During our interview at Segaris Art Centre in Publika Shopping Gallery, Sharifah Fatimah’s slender frame is clad in a plain white top with a brown headscarf. Her style is modest, as her faith dictates, but there is an undeniable air of sophistication and self-assurance when she speaks or moves. This is a woman, I realise, who can make eating yao char kuey — a snack the gallery staff had brought her as breakfast —an elegant affair. Born in Alor Setar in 1948, Sharifah Fatimah is an eighth-generation descendant of a privileged Hadramawt family. Her love affair with nature, which became the overarching theme in almost all of her paintings, started when she was only five years old. Armed with a tolerance for mud, dirt and mosquitoes, the young Sharifah Fatimah — seduced by botanical mysteries —climbed trees and collected flowers on a nearby hill. The intricate patterns of leaves intrigued her as much as the formation of pretty rocks chiselled by the rapid waters of the river. While other children huddled over games of batu seremban and congkak, she was busy pressing freshly-picked flowers onto the pages of an exercise book or pounding sandstone into powder. That was her idea of fun. Sharifah Fatimah was among the pioneer batch of fine art students at the Mara Institute of Technology (now known as UiTM) in 1967. Under the tutelage of lecturers Dr Jolly Koh and Dr Choong Kam Kow, she graduated with a diploma in 1971, complete with a best student award. She became a full-time artist in 1973 and continued to collect a string of achievements including the Bank Bumiputra Prize for her acrylic on canvas works, Rose of the Wind and Tribute to Rumi, and a consolation prize for Meditation in the acclaimed Young Contemporary Artist (Bakat Muda Sezaman) competition. Her works were officially showcased to the world when she held her first solo exhibition at Singapore’s Alpha Gallery in 1972. Ask any teacher for career advice and he or she will say, “Follow your passion”. That is a great piece of wisdom, provided you truly know what you want to do for the rest of your life. But the confident Sharifah Fatimah, who marched to the beat of her own drum, had already mapped out her path clearly. After graduating from UiTM, she enrolled in a course in fine arts at Reading University in England in 1973 and graduated with first class honours. She also took home a university prize. Her outstanding academic performance led her to complete her postgraduate studies at the Pratt Institute in New York in 1976 with a John D Rockefeller III Fund Fellowship. Some of Sharifah Fatimah’s meteoric success is attributable to her genetic makeup, as her mother, Rokiah Hassan, had trained in tenun in a palace near the Balai Besar in Alor Setar during the mid-1930s. Like the three literary Brontë sisters or the famed artistic Pollock brothers, Sharifah Fatimah also grew up with creative siblings. Three of her sisters dabbled in textile design, fashion and interior design, while her brother studied architecture. As it turns out, even her extended family also demonstrates a great proclivity towards the arts. “My aunties and grand-uncle love carpentry. Whenever there is a wedding in the family, they would gather to make the curtains and pelamin (wedding dais) and decorate it with flowers made from crepe paper. Most of the decorations are stitched and assembled by hand. Surprisingly, the house is usually very calm on festivals like Hari Raya,” says the soft-spoken Sharifah Fatimah as she flicks through photos of her family on her phone. She suddenly stops at a black-and-white photo of a woman — swathed in floral batik print and hair pulled into a bun — cradling a child with motherly love. “This gentle-looking lady is my grandmother. I used to pester her to tell me tales of Malay folklore because the older generation always has the best stories. “But I wasn’t exactly talkative with my mother. I remember her sewing, the most. She would make beautiful embroideries and sell them to her friends or relatives. I still have some of the tudung she made for me,” Sharifah Fatimah says a little wistfully. The photographs are both a chasm and a bridge to yesteryear — it dawns upon Sharifah Fatimah that she did not get to know her grandmother and mother better, but at least she gets to revisit bygone versions of them — when they were beautiful, strong and nurturing — through these images. “Family is still the most important,” Sharifah Fatimah asserts. Childhood art, usually enshrined on refrigerators or the walls of our home, is often amateurish, but for Sharifah Fatimah, it was an indication of her future brilliance. If she was not poring over the gripping adventures of Enid Blyton’s much-loved Famous Five quintet or one of Charles Dickens’ illuminating classics after school, she was frequently found with a paint brush. She continued to develop a great knack for colours and composition as a teenager, so much so that she sold her first landscape painting to her teacher — a Miss Chin — at SMK Sultanah Asma in Alor Setar for RM30, a hefty sum back then. “She gave it to her friend as a birthday present, while I got some good pocket money … to get myself a gift,” Sharifah Fatimah chuckles. Her passion for the arts was also ignited by her Malay literature teacher Saidin Yahya, who was one of Malaysia’s earliest cartoonists in the 1950s, depicting the story of Hang Tuah in a famous series of five comics. Saidin is a member of Persatuan Pelukis Melayu, Malaya (Society of Malay Artist, Malaya), together with Abdullah Ariff, Idris Sallam and the legendary AB Ibrahim. Sharifah Fatimah respected these art devotees who commanded exceptional technical abilities but she was most enthralled by the works of landscape luminary AB Ibrahim, a dear friend whom she looked up to. “Watercolour painting was most famous during the 1950s and 1960s. I used to go to AB Ibrahim’s home to see his works. His works could really sell, and the money was used to not only support his children but also his brother’s,” Sharifah Fatimah explains. She recalls that the self-taught old master sold his paintings at the shop-fronts along Penang Road and Chulia Street. AB Ibrahim’s romantic landscape paintings with uncommon nostalgic moods had set an aesthetic paradigm for many fledgling landscape artists. 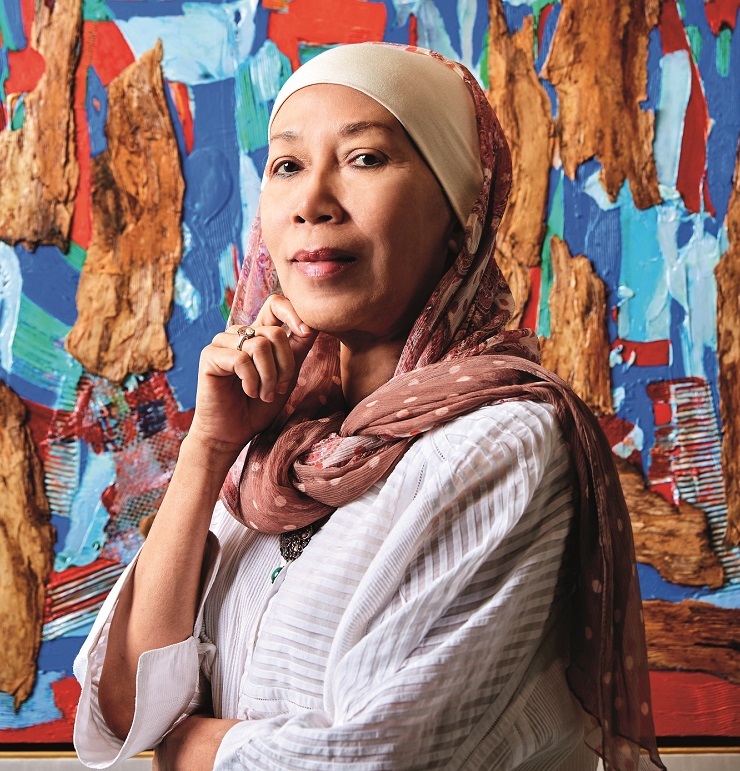 Inspired by more artists she met in her career — such as National Art Laureate Datuk Syed Ahmad Jamal and her closest peer, German fine graphic artist Ilse Noor — Sharifah Fatimah forged her signature style in abstract art, even though she had practised figurative art as a student. 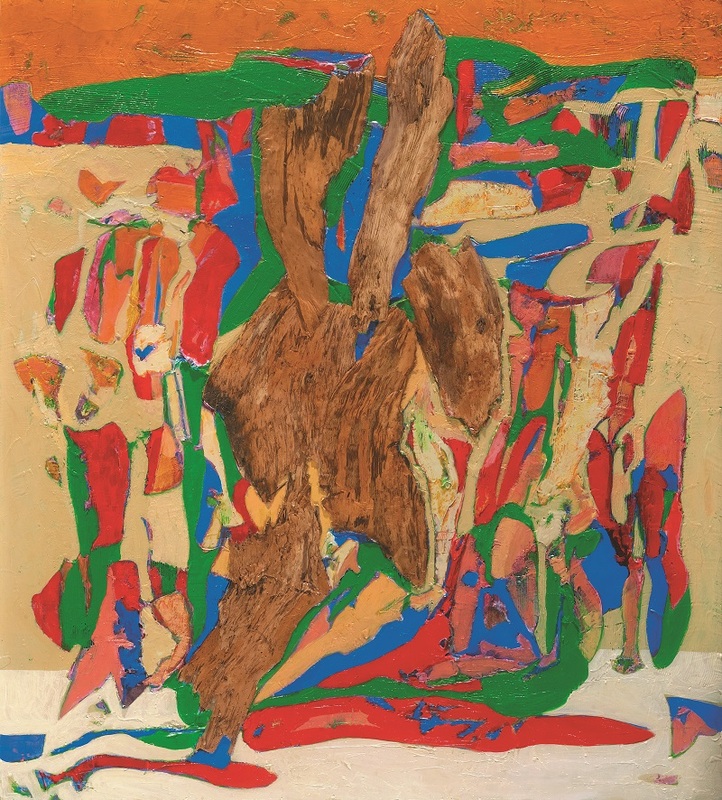 Art critic Ooi Kok Chuen applauded her for “setting a highly individual métier with post lyrical abstractions” that is ingrained in “Asian roots and [an] intrinsically Malaysian flavour, and couched with Islamic evocations and vestigial textile trademarks”. To diversify her skills, she took a museum management course at City, University of London, in 1987 while she was a curator-coordinator at the National Art Gallery Kuala Lumpur (National Visual Arts Gallery now) from 1982 to 1990. During her stint at the gallery, she curated Ibrahim Hussein’s exhibition, A Retrospective. Alas, the profession distracted her from her one true love — art — so she unfastened the shackles of a nine-to-five job to become a fulltime artist and art consultant. She went on to become a writer, delegate, judge, external examiner and curator in numerous high-profile exhibitions at home and abroad. She won the third prize in the Second Biennale of Contemporary Painting of the Islamic World in Tehran in 2003; was conferred the Darjah Dato’ Setia DiRaja Kedah in 2007 — the first woman to be awarded for her contributions to visual arts; and received the Women of Excellence Award Malaysia for outstanding achievements in Arts, Culture and Entertainment in 2014. Sharifah Fatimah’s stature as a formidable artist was further enhanced when her coveted works were hung in palatial foreign museums and institutions such as the Museum of Modern Art, New York; Jordan National Art Gallery of Fine Arts; Museum of Contemporary Art, Croatia; Sharjah Art Museum, United Arab Emirates; and Singapore Art Museum. Her success was given due recognition in 2013 when the National Art Gallery held her exhibition, entitled Pancawarna, Karya Pilihan 1990-2012 Selected Artworks, showcasing 100 works from five of her main series, namely Touch the Earth (1992-1996), Mindscape (1991-1993), Joy is the Theme (1997-2003), Garden of the Heart (2005-2011) and Celebration (2010-2012). The serendipity of chancing upon something off the beaten track and a kaleidoscope of new sights, sounds and experiences are the reasons why Sharifah Fatimah relishes travelling. She has always sought out the quiet romance of Europe. It is a honeycomb of hidden treasures where she can immerse herself in Germany’s river valleys and hulking castles in fairytale settings, Italy’s café-lined streets and the Netherlands’ historic canals flanked by tilted gabled buildings. Of course, she is also drawn by the continent’s vibrant art scene that bristles with energy. It has long been said that travel broadens the mind, but it has also stretched the boundaries of Sharifah Fatimah’s comfort zone. A visit to her ancestral homes, places of worship and tombs in Islamic countries such as Iraq, Jordan, Indonesia, Yemen, Egypt, Saudi Arabia and Bahrain in the earlier 2000s spawned the bold Garden of the Heart exhibition — a startling departure from her usual lyrical expressions — featuring readymade textiles, embroidery, gold foil transfers and appliqué techniques. “Sometime in the 2000s, I could not paint. My hand was injured and I could not lift it up to paint for several years. So the only things I could do were weaving and needlework — things my grandmother and grand-aunt were adept at. So, Garden of the Heart, in some ways, is a tribute to my ancestors. Maybe this was the way God told me to do something else instead of just painting,” Sharifah Fatimah laughs. The works from Garden of the Heart proved to be more than just a homage to the lost art of the telepuk technique or the gold leaf treatment derived from Indian traders centuries ago. Like the therapeutic power of music, art has become a refuge through which we can banish our anxieties and recover hope. It appears that Sharifah Fatimah’s works, which usher in calm, possess such healing power. Like the therapeutic power of music, art has become a refuge through which we can banish our anxieties and recover hope. It appears that Sharifah Fatimah’s works, which usher in calm, possess such healing power. Nevertheless, Sharifah Fatimah is still hopeful about the future of the Malaysian art scene, thanks to the creative generation of contemporary young artists and curators. “In terms of art, we’re more dynamic compared with other Asean countries. I quite like works by Shafiq Nordin, Chang Fee Ming, Umi Baizurah and Najib Ahmad Bamadhaj. And Yee I-Lann’s lyrical photography, because there is a deep cultural meaning behind her works. If a workspace is a faithful reflection of the soul of the artist, you can imagine just where Sharifah Fatimah creates her craft. Her three-storey link house is full of paintings — mostly her own and some by friends such as Filipino abstract artist José Joya, Ibrahim Hussein and Syed Ahmad Jamal — to fuel her creativity. The soothing tunes of nasyid and kacapi suling — a form of Sundanese music from West Java — are always permeating the house, instilling in her a sense of calm. It was in this tranquil atmosphere that Song of Eucalyptus, an extension of Sharifah Fatimah’s famous eucalyptus bark oeuvre, was born. Her latest works — all 32 paintings categorised under Song of Eucalyptus, Pattern of Dream, Eucalyptus at Reactory and Eucalyptus Image — continue to celebrate the complexities and beauty of the eucalyptus bark, which evokes the sense of “a forest within the painting”.